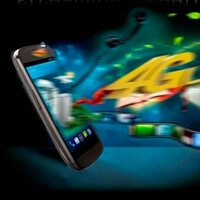 Sprint customers that covet the LTE Galaxy Nexus, your wait may finally be coming to an end. 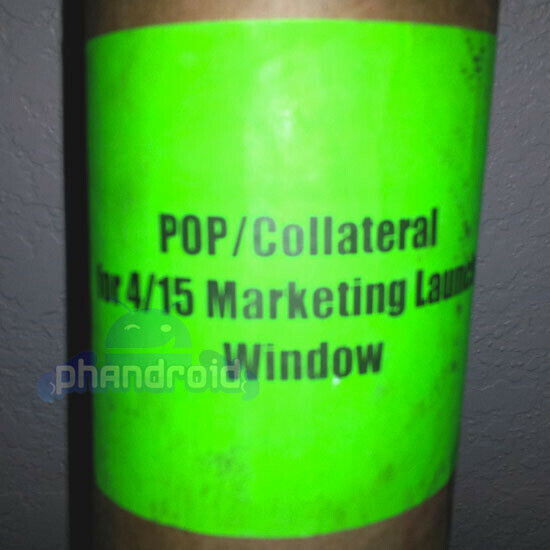 A tipster over at Phandroid has supplied photographic evidence of window posters advertising the Galaxy Nexus for Sprint, and they came marked “do not display before” date of April 15th. 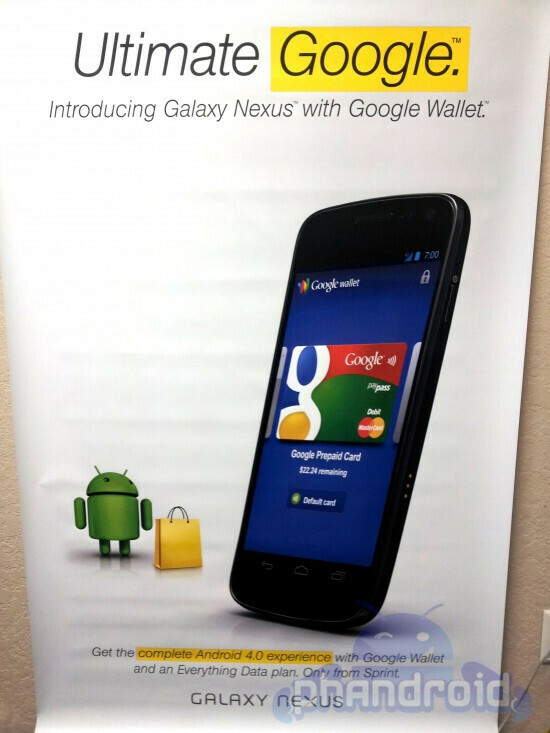 We know the phone is coming soon – it’s already cleared the FCC, and both April 15th and the 22nd have figured prominently in rumors for the long-awaited launch of Google’s flagship Android handset for “the other U.S. CDMA network.” In a way these posters don’t clarify between the two, as the advertising could go up a week early in an attempt to stoke interest. Regardless, it looks like Sprint customers should see a launch either this weekend or next. This or the EVO LTE 4G....Damn that EVO is looking good. I think I will hold off until July....Damn Sprint this is just a tad late. Even without LTE it should have been released early I think. Well Now its time to see whats's what in the near future. Has Sprint's LTE gone live yet in any cities? It has gone live in a city in Kansas since you asked. Testing is under way to get rid of any kinks for the June launch. By the end of the year, Sprint's LTE network will have the same footprint as their WiMAX network (covering 130 million POPs). There will be some overlap but not all markets will have LTE and WiMAX. They mentioned they wanted to get LTE to the largest markets first but would consider other markets without WiMAX for earlier LTE deployment, considering the others already have WiMAX which could hold them over until full nationwide deployment. Idk, I think the EVO 4G LTE is the phone for me :) I love stock ICS, but something about Sense makes me want it more, and plus that screen, and the S4 processor. Just seems like an overall better device. I'm switching to sprint may 29, and I would gladly go without a phone for a few days (with the rumored June 6 launch date) and wait for my preordered EVO to arrive, than have the Nexus and miss out on what the EVO has to offer. With the rolling out of HD VOIP and LTE you and your carrier will catch up. This is just going to make the Nexus look bad and sprint less likely to adopt the nexus line in the future. The phone is 5 months old and Sprint has hardly any LTE network...I can't imagine this selling very well but that is not the fault of the phone. I hate it when carriers do this. Some idiot will later point to the low sales as reason why sprint should focus less on the Nexus phones. LTE will light up in NYC and most major markets by June. Getting this phone with last years technology is the only fail since quad cores, and SG III is on the horizon. However the Developers ASOP is the best reason to get this phone at this stage. The EVO 4G LTE looks way better spec wise, and review wise I believe. Except for the Nexus One, none of the nexus line of devices have been made to be truly a monster of a device. The nexus S was on the same boat, better spec wise devices came out shortly after its release. Just as the Nexus S, the GN will be bought by those who really want the vanilla experience. Beyond that, i think, most will see the EVO LTE as a better offering. I'd like to know if the Sprint Galaxy Nexus will have any different specs compared to the VZW version. Not sure if Sprint and VZW have EVER shared the same exact flavor of a device other than the iPhone 4S. maybe band difference, just like the LTE on the iPad but specs will remain the same so far. Still hoping to with one on April 16th, that's the only way I would get a GN. My upgrade is summer 2013 so can't afford to get another phone right now. I just dont understand why they cant just tell us when its coming. Its been on VZW for 5 months, what's the big secret? Yeah, what could the big mystery be about? Some people have already looked passed the GN on Sprint and moved on to the Evo One and GSIII for this summer, I've been waiting for the GN for so long I'm to the point where I can wait another couple months for the SGSIII and Evo One. I do hope Sprint's GN atleast has the 1.2 dual core Exynos processor, I would buy it as soon as it's released. I've heard nothing but good things about the Exynos processor. Well good news. The launch date for the LG Viper is the 22nd and Sprint did say the nexus is supposed to be the 1st LTE phone for sprint. So best case scenario, we'll see it this sunday. Worst case, it will come out alongside the Viper. Where did you here this? I only heard it going up for pre-order on the 12th. Just tell us what you know. Its not like we are actually waiting on the LG Viper anyway.